Marine propulsion is undergoing a paradigm shift these days, mostly due to fuel costs and the need to address the problem with improved efficiencies. Diesel-hybrid systems, fuel-cells, injector technologies, even wind-powered, computerized kites—while the ways the shift is manifesting are diverse, many new developments are technical, often futuristic. But there&apos;s one approach bucking the trend. 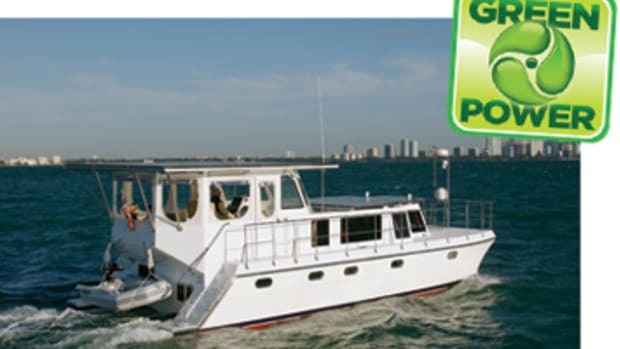 Island Packet, heretofore mainly a builder of sailboats, is now selling the PY (Power Yacht) Cruiser, a modern, diesel-powered trawler that borrows from established sailboat design, adapts it to bluewater powerboat cruising, and with a nod to traditional styling, produces an attractive 41-footer with decent speeds and remarkable fuel efficiency. The PY&apos;s a tricky sort of vessel. Coming, as she does, from the drawing board of naval architect (and head honcho of Island Packet) Bob Johnson, you&apos;d figure her for a denizen of the full-displacement realm. After all, Johnson&apos;s drawn a host of savvy sailing vessels during his long career, and many have sported what seemed to be full-displacement underbodies. Yet Johnson maintains that most of the recreational vessels he&apos;s created over the years have really been semidisplacement specimens. And the test data I recorded while sea trialing the PY on the Manatee River near Snead Island, Florida, supports the contention. 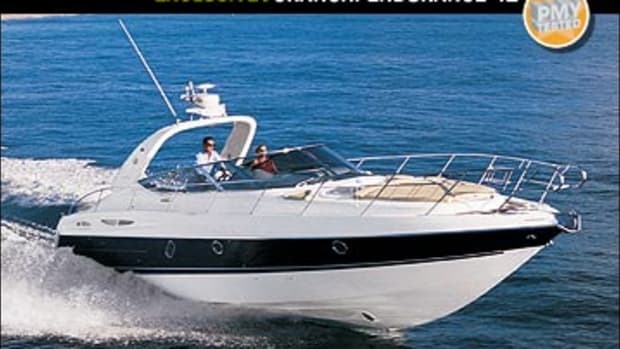 Check it out—based on a manufacturer-reported length-on-the-waterline of 34&apos;9" and using the formula: Hull Speed = the square root of 1.34 X length-on-the-waterline, the PY&apos;s theoretical hull speed works out to be 7.9 knots. But my radar gun clocked an average WOT velocity of 10.9 knots, topping theory by 38 percent! How does Johnson do this? "There&apos;s some fuzziness to the process and maybe a little art," he notes before launching into an explication of the three design tweaks he used to make the PY both super efficient and speedy. The first, he says, entails boosting the hull&apos;s prismatic coefficient, a naval architectural term denoting fullness or bulk of the hull form. By carrying the PY&apos;s beam both farther forward and farther aft, Johnson was able to push the bow wave ahead and the stern wave astern, thus tricking Mother Nature into seeing more length-on-the-waterline and thereby more theoretical hull speed. The second entails flattening the PY&apos;s stern sections, a lift-generating measure that reduces hydrodynamic drag and minimizes bow rise. Evidence of this last feature, by the way, shows up in the running attitudes I measured. 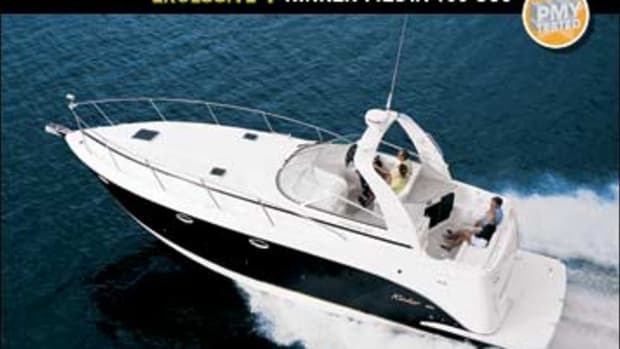 Notice that while the PY rides an even keel for the most part, she tilts forward at mid-range speeds, a phenomenon partly attributable to flat, lift-producing stern sections. 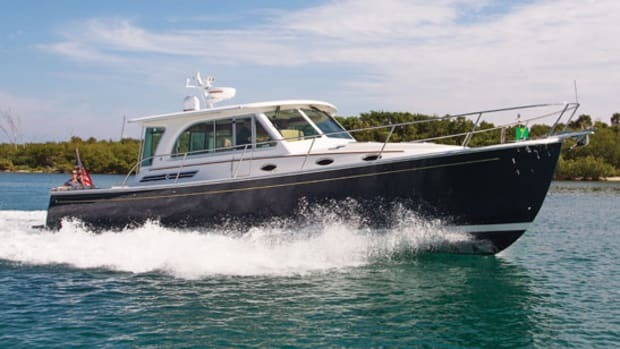 The third tweak entails the installation of a 100-mhp Yanmar diesel (which will be replaced by a newer 110-mhp model on future PYs) that&apos;s got just enough juice to do the job. The totality of the performance data arising from this mlange is striking. 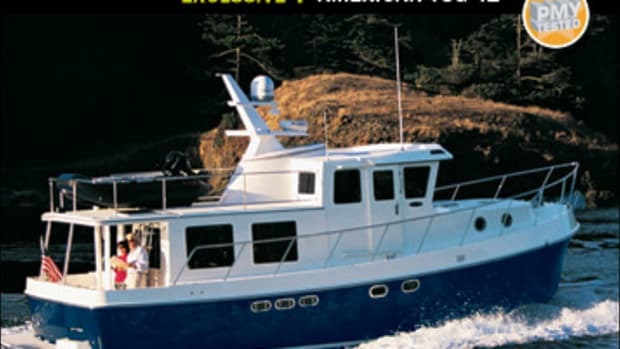 In an era when fast trawlers post slo-mo economies of 2 mpg or less, the PY offers velocities of 8.3 and 9.1 knots at operating efficiencies of 5.1 mpg and 4.0 mpg respectively. 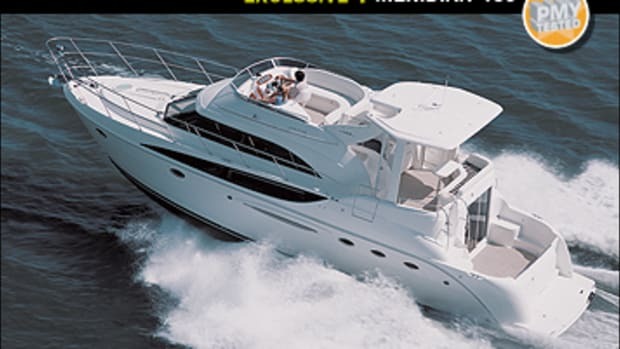 If you dial &apos;er back to a sedate 7.3 knots, running efficiency hits a wallet-warming 16.8 mpg! Certainly, benign conditions on test day (including calm sea conditions, a scrupulously slick bottom, and little in the way of liquids and other weights onboard) contributed to all this wonderment but still, how many other vessels on the market today come even close to this? A few foibles surfaced during the handling of the boat, however. Visibility from the wheelhouse helm station was excellent in open water, thanks to the absence of bow rise and an all-around assortment of windows and windshield panels. But while opening the door from the wheelhouse into the cockpit during docking maneuvers produced a helpful, over-the-shoulder view of the port quarter, the starboard quarter remained invisible. And while turning the vessel through 360 degrees in the fairway prior to entering our slip, I chafed at the PY&apos;s ponderousness. 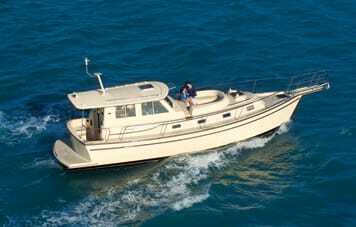 Usually, I can spin a single-engine trawler through 360 degrees in three, back-and-fill phases. It took several with the PY (sans bow thruster, of course), due to her keel&apos;s resistance to lateral movement as well as her heft. Indeed, the PY&apos;s no lightweight. 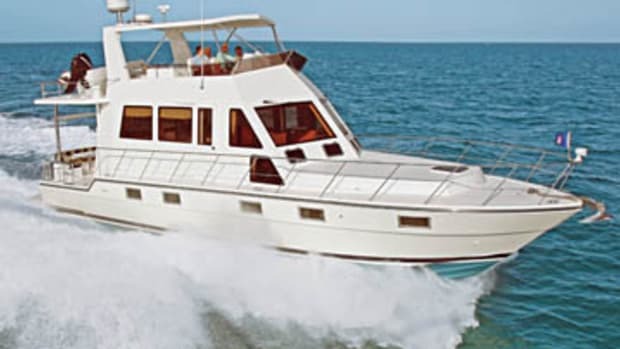 While she comes in at about half the 50,000-pound, full-load displacement of a Nordhavn 40, she still approximates the displacement of your average twin-engine express cruiser. Yeah, she&apos;s got a lean hull of solid, high-modulus knits and vinylester. But there&apos;s 5,000 pounds of ballast at the bottom of it all. 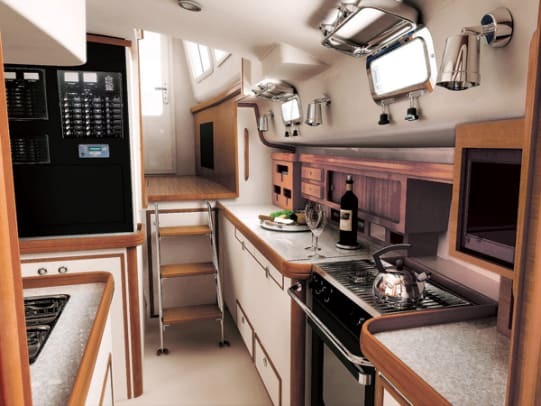 Even a brief sojourn onboard reveals more roominess than you&apos;d expect from a sailboaty trawler. The wheelhouse is both spacious and, thanks to a dining table, Zwaardvis helm chairs, and an L-shape lounge, comfortable. 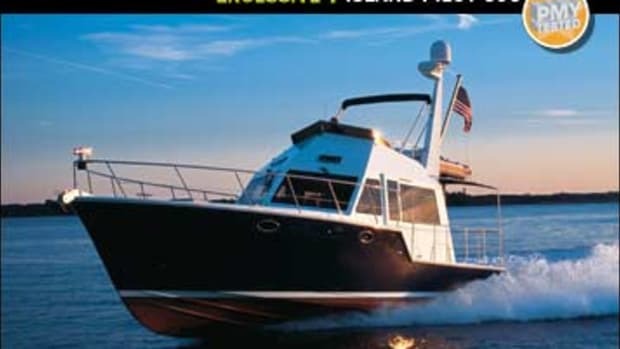 Below decks, there&apos;s a beamy master forward, a guest stateroom aft and to starboard, and a full galley (with adjoining head with a separate shower stall) in between. I&apos;ve got two criticisms. First, while the machinery space under the inboard guest stateroom berth is solidly engineered, with top-notch equipment, jacketed fuel lines (with swedged and threaded ends), and seacocks installed on load-spreading fiber doughnuts, access is a stretch. Then there&apos;s the structure molded into the coach roof just forward of the wheelhouse—the "forward cockpit." When I suggested that it detracts from an otherwise classic profile, Island Packet responded: "Owners love it—it&apos;s their favorite spot to relax." I wouldn&apos;t finish with a one-two punch like this if I didn&apos;t think Island Packet&apos;s PY Cruiser could take it. 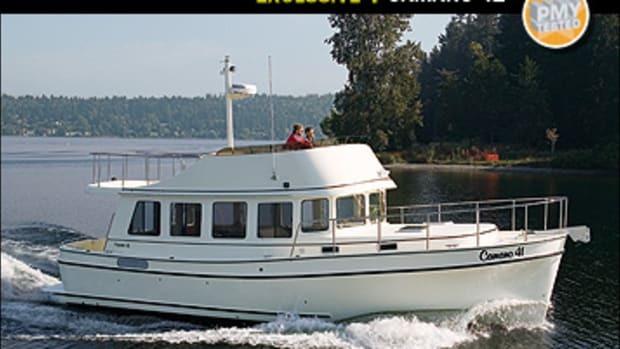 Maybe this traditional-looking paradigm of conventional wisdom&apos;s not a purist&apos;s dreamboat, but considering the fuel-efficiencies she&apos;s capable of, and the roominess of her layout, most everybody&apos;ll love her anyway. 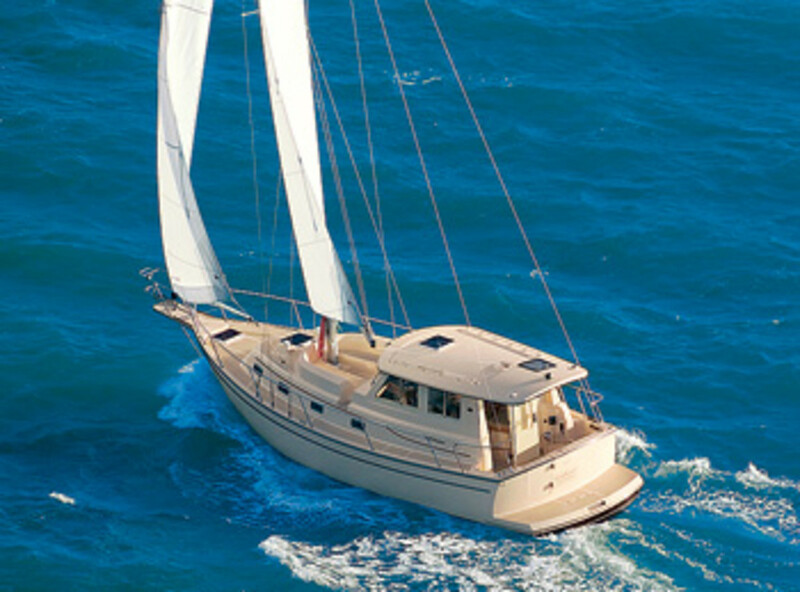 For more information on Island Packet Yachts, including contact information, click here. The PY Cruiser is not the only highly efficient vessel Island Packet&apos;s recently put on the market. There&apos;s also the SP (Sail Power) Cruiser, a sloop-rigged vessel that&apos;s virtually the same as the PY in terms of layout, design, and horsepower as well as speed and fuel burn under power. But the SP also sails almost effortlessly. Say you&apos;re chugging along and decide to nix the Yanmar and switch to wind power. 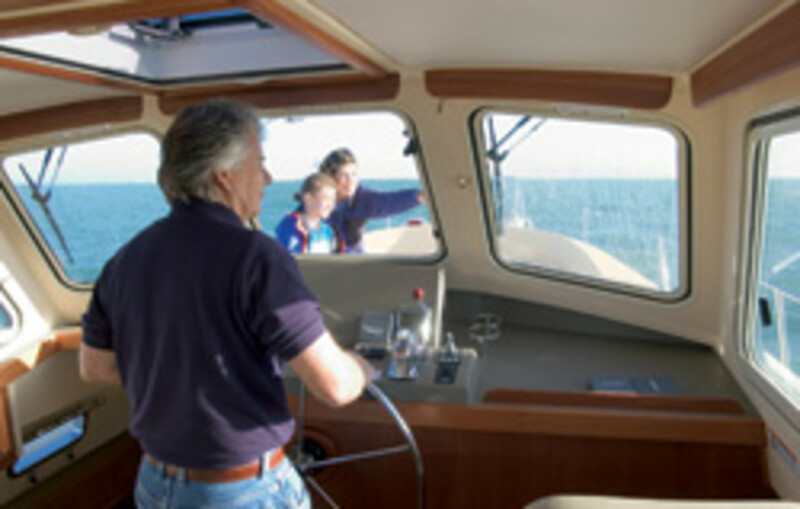 Simply round up into the breeze, leave the helm for the cockpit momentarily, load the lines into the Lewmar electric winch, and then return to the helm to tweak arrangements with push buttons as you proceed. Could there be anything as easy—and as fuel efficient—as fully electric sail controls? Well, yeah. According to Island Packet, the company will introduce a version of the SP Cruiser within a year or so that will virtually sail herself. Thanks to constant digital input from a wind indicator at the top of the mast as well as some serious computer firepower, the boat will electrically operate her own winches, trim her own sheets, perhaps even decide when to tack based on course information arriving via GPS. All you&apos;ll have to do is steer! —B.P.